The rules of the game a very similar to the classic rules: The game starts with a board of "closed" squares. Some of the squares are blank and some have nukes. There are total of 20 nukes. You press on any square on the board and it "opens". The first time you open a square it is guaranteed to be blank. The number of nukes in the adjacent squares is displayed in the open square. 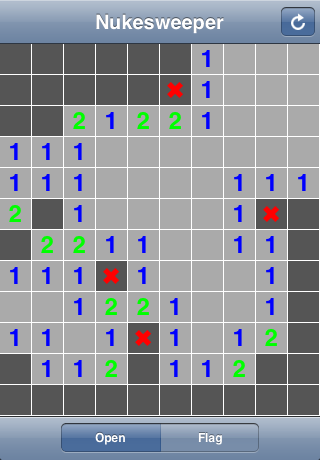 The goal is to open all blank squares without opening any squares with nukes.